Heading up the stairway (west) to the second floor, you will be facing the House of Representatives. To the right of the House entrance, you can see the bell that used to ring the time of day on the battleship USS Rhode Island. 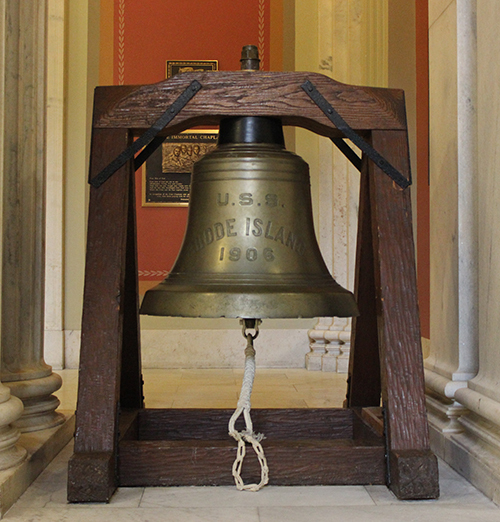 The bell is about 2-1/2 feet in diameter. The ship was first launched in 1904. It was part of President Theodore Roosevelt's "Great White Fleet". There were sixteen battleships in that fleet. President Roosevelt sent the "Great White Fleet" on a good-will tour around the world from 1907 to 1909. The Senate Chamber is a very beautiful room. You will find it on the second floor on the east side of the State House. The Senate Chamber is 56 feet wide, 44 feet long, and 46 feet high. The furniture is made of a beautiful dark mahogany. 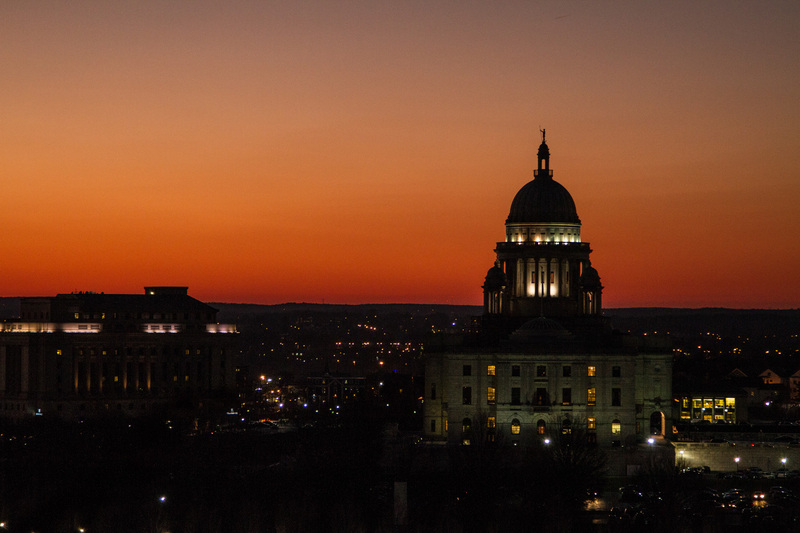 Our State has thirty-eight Senators, because Rhode Island has thirty-eight senatorial districts. Our Senators are elected to serve two-year terms. 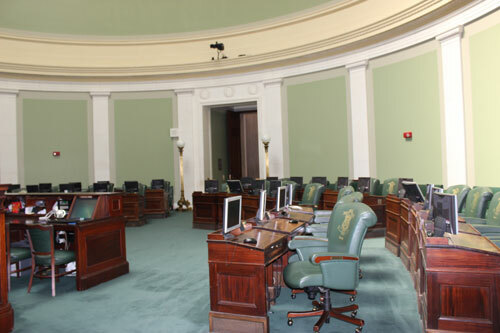 The Senate Chamber has thirty-eight desks, one for each Senator. On each desk you will see a microphone and buttons. The buttons are used to vote by pushing green for "yea" (yes) and red for "nay" (no). The buttons are also used to get permission to speak. A Senator will not be recognized unless the button is pushed on. Each desk also has a computer where the Senator can review the legislation that is being discussed. There is a large electronic tally board placed high at the front of both sides of the Senate. Each legislator's name is on the board. When they vote, everyone can see how each person voted. 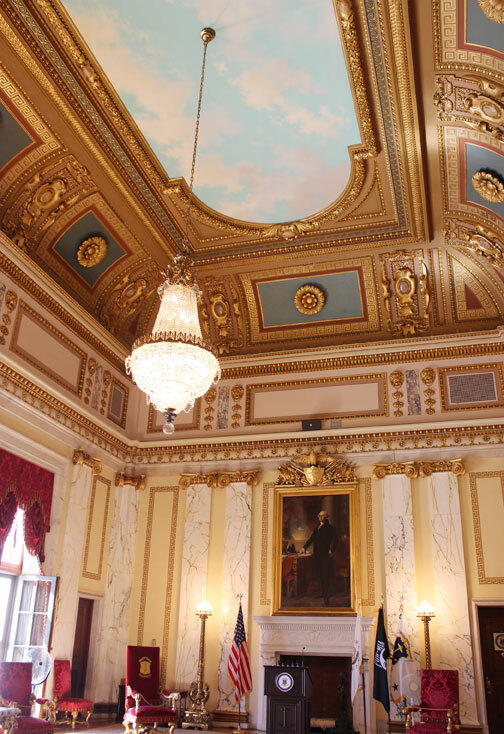 On the archway, high above the Senate, are the seals of the thirteen original colonies; the seal of Rhode Island is located in the middle. The gallery, which is the seating located above the chamber, is where visitors can watch the Senate while it is in session. Would you like to come and watch? The House Chamber is a magnificent room. It is found on the west side of the second floor. It is 56 feet long, 56 feet wide and 46 feet high. 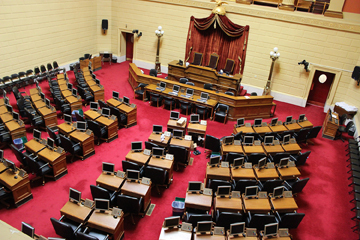 There are seventy-five members of the House of Representatives, because Rhode Island has seventy-five representative districts. Our Representatives are elected to serve two-year terms. The Representatives elect one member as their Presiding Officer. That person is called the Speaker of the House. The Speaker controls the meetings. The Speaker also controls the flow of new legislation. Just like the Senate, the House has four buttons on each desk: green to vote "yea"; red to vote "nay"; white to be called on to speak; and yellow to call a page (a person who acts as an assistant or messenger for the legislator). Each desk also has a microphone so everyone can speak and hear the discussions clearly. Each Representative also has a computer at his or her desk. There is a large electronic tally board placed high at the front of both sides of the House. Each legislator's name is on the board. When they vote, everyone can see how each person voted. The room is beautifully designed with solid oak desks and furnishings. 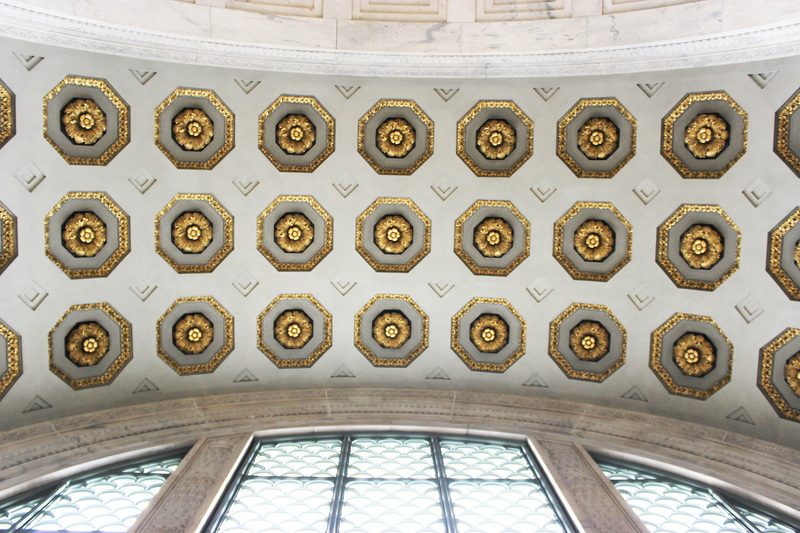 The ceiling is arched on four sides with an interesting boxes-within-boxes design. A huge skylight fills the center of the ceiling. Colorful tapestries hang on the left and right walls, with scenes of the Greek/Roman countryside. Would you like to be a legislator some day? If you like books, you will love the Rhode Island State Library. It is on the second floor of the State House. It has a wonderful display of books, showcased in a three-tiered, beautifully decorated room. 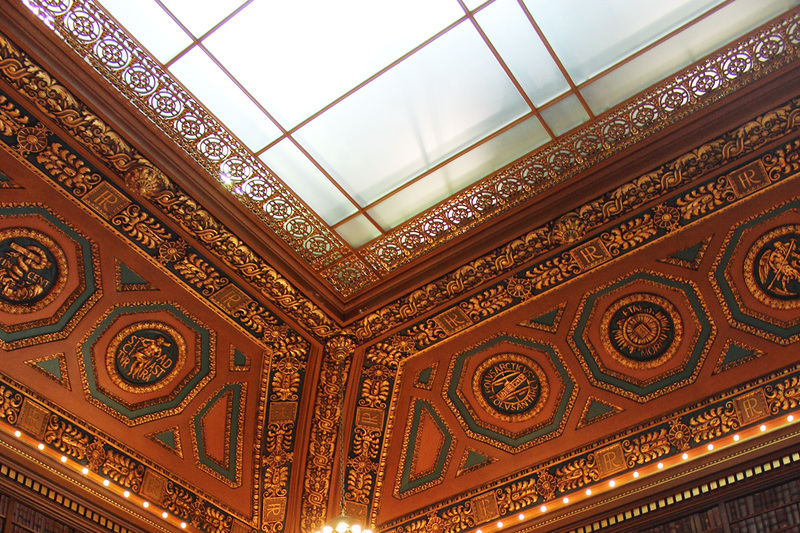 The windows in the room are nearly two-stories high, and the ceiling is especially beautiful because it is heavily decorated with intricate gold leaf designs. Set in the ceiling, you will find the seals of world-famous printers from the Renaissance period 500 years ago. Like other libraries, our State Library has books, magazines and newspapers. 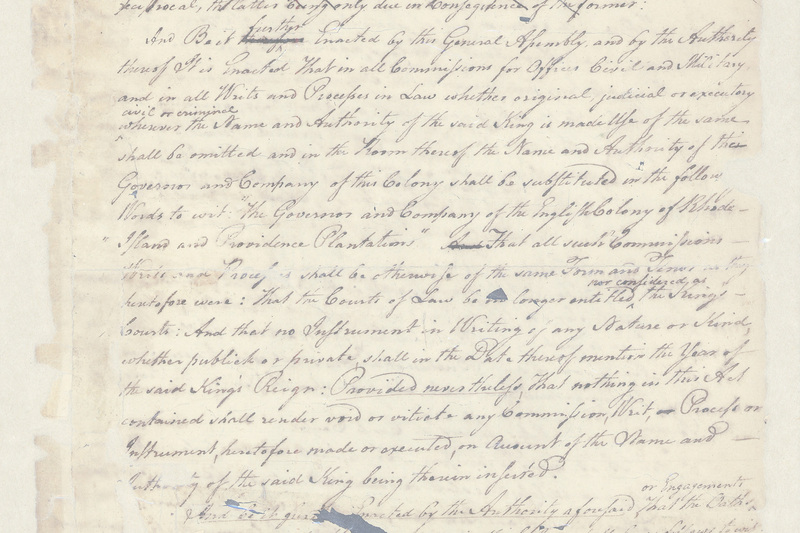 It also has official documents and records of the United States Government and the states. 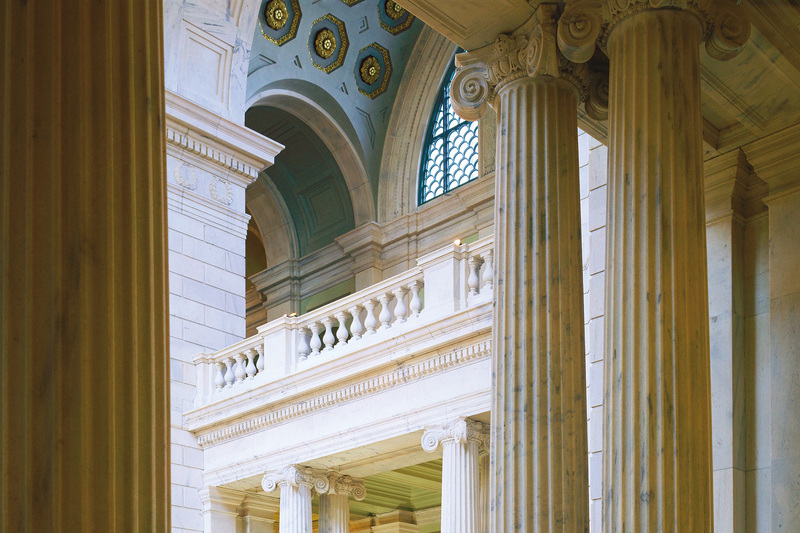 At the State Library you can find information about Rhode Island history, politics, science, and social science. Senators, Representatives and other lawmakers come here to do their legislative research. You too can come to the State Library because it is open to the public. The Secretary of State is in charge of the State Library. 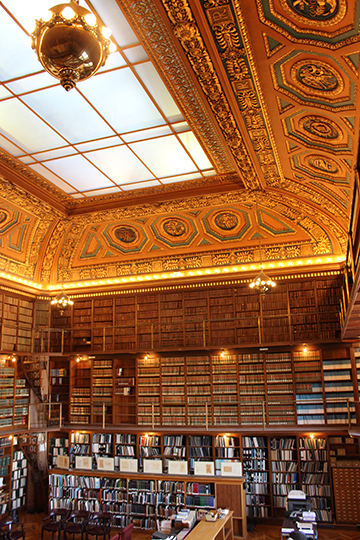 On the second floor you will also find 4 bronze-encased books known as the "Honor Roll". 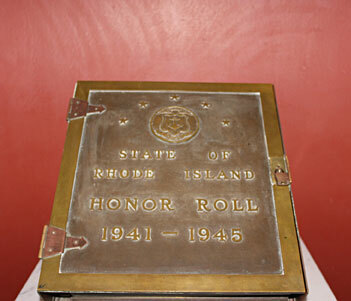 These books hold the names of the more than 2,000 Rhode Island men and women who lost their lives while serving our country during World War II. These names of our heroes are in a place of honor. The Secretary of State is the custodian of these books. The Executive Chamber is on the second floor. The first room of the chamber is called the State Room. This is the entrance to the Governor's Office. Visitors are welcome to visit the State Room. It is one of the loveliest rooms in the State House and it has many interesting things to see. Once inside, you will be facing windows which provide a sweeping view of the City of Providence. A beautiful crystal chandelier graces the ceiling, while each side of the State Room has a magnificent marble fireplace. The pride of the State House treasures is the painting of George Washington done by Rhode Island artist Gilbert Stuart. It is a national treasure because it is one of the most famous paintings of our first president. Visitors like to move from the windows to the entrance doorway while watching the pointed toe of Washington's foot, it seems to move and continue to point in their directions.